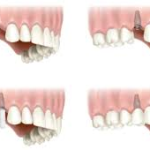 We are now offering Mini Dental Implants (MDI) as an added service to our patients for only $800 per implant. Mini Implants are a less invasive procedure, usually no surgery required. Therefore, less appointments and far less discomfort post procedure. Saving you time & money. If you’re missing a natural tooth it can be replaced with a crown supported by a MDI. The MDI acts like a natural tooth root replacement. MDI’s can also stabilize your dentures so you can eat, chew & speak with confidence & comfort. Often times gum disease, tooth decay or trauma to a tooth can be too extensive and makes saving the tooth not an option. Our dentists do a variety of extractions starting from simple extractions leading to more difficult surgical extractions. If a tooth or multiple teeth need extracted our office can provide healing partials or dentures that can be placed immediately after the extractions. These healing appliances will help you eat, speak, and avoid embarrassment. Patients with tooth aches are encouraged to call the office as soon as possible. With short waiting times and phones answered 24/7 we are able to see almost all emergency patients the day they call. Your emergency visit will include 1 x-ray, a prescription if needed, and 1 simple extraction for $100. 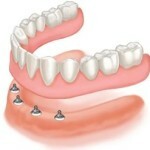 Here at Five Star we not only do removable dentures but also focus on a total health approach. We offer everything from crowns, bridges, fillings, and cleanings etc. At the first appointment you will have a complete set of x-rays taken and a treatment plan provided for you with all the recommendations. You will also be able to talk in detail with the dentist about any concerns. Listed below are some additional services and their prices. Other services are provided that are not listed below please call our office for further information.